Stop us if you've heard this but the Penguins are playing in an outdoor game! Last night the NHL formally announced that the Penguins would take on the Flyers in Lincoln Financial Field, home of the Eagles, on Saturday, February 23rd, 2019. It was a well known secret that the Pens were playing a home and home outdoor series against the Flyers. With the Pittsburgh venue being Heinz Field it seemed likely that the Flyers would be hosting and their NFL venue. As such it's announced and it is so. Despite noticeable fatigue in the outdoor game scheduling, and the watered down product of the spectacle of hockey outside, the league continues to pump out outdoor games featuring the same teams in the same cities. This time the league is banking on a new venue, Lincoln Financial Field, to boost sales. While the TV spectacle of Heinz Field this past February looked good, those in attendance could attest to empty seats that were out of view (perhaps strategically) from cameras. 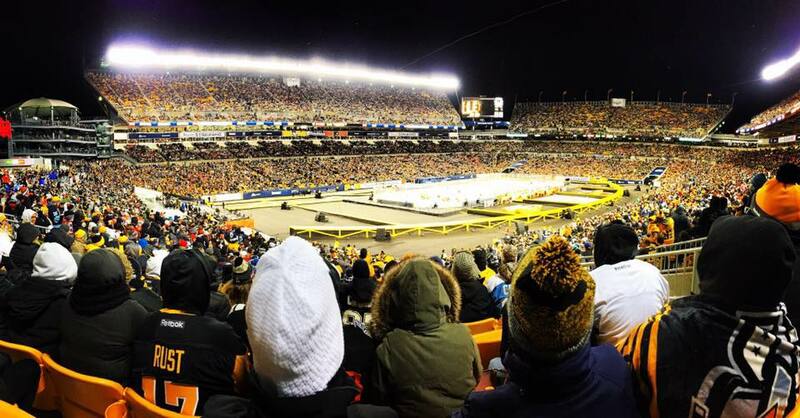 The author has attended three outdoor games now (Winter Classic at Heinz, Stadium Series in Chicago, Stadium Series in Pittsburgh) and noticed a distinct lack of buzz surrounding this most recent go-around of Penguins outdoor hockey. Perhaps the league's issues with venue (surely they wanted PNC for a chance but were unable to secure a time frame) or the question of weather (it was 60+ degrees the night before when I pulled in to Pittsburgh) was an issue. Perhaps ticket pricing for an event we've all seen before, with a rival that's felt less of a rival lately, led to a lack of appetite to see our favorite flightless fowl take the ice outside for a fourth time of "once in a lifetime" events. Maybe big event fatigue was an issue. The Penguins had played in the Cup not long before. The Steelers were in the AFC Championship game mere weeks before. Either way the last incarnation of the outdoor dual was lacking. Will Penguins fans care enough to make the six hour trip across the state to the unfriendly, and by myth and lore unsafe, confines of Philly's sports haven? Will Pittsburgh fans decide, instead, to stay home and maybe we'll watch it on TV again thanks? Will anyone care that, once again, the gang is outside when ho hum it's the fifth time they've done this? We'll all find out February 23rd, 2019. And we'll at least be surprised the Blackhawks aren't involved.